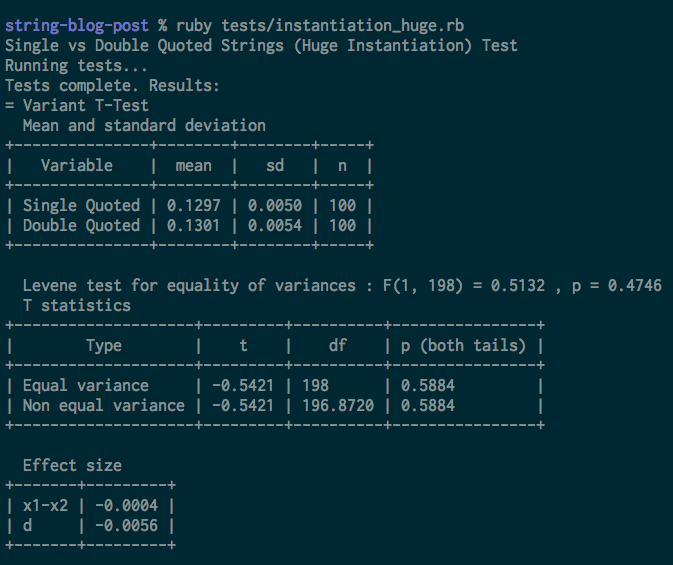 If you've written Ruby, you've heard it before: Use single quoted strings unless you need string interpolation. It makes sense, right? 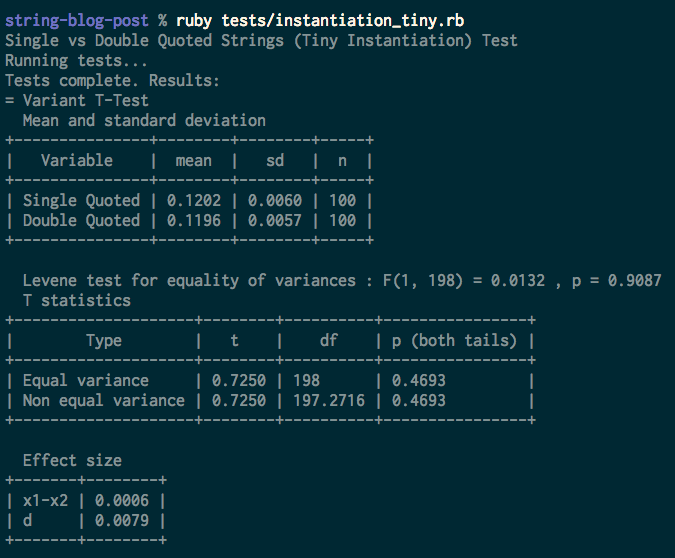 When I instantiate strings using double quotes, the Ruby intepreter has to do extra work to figure out if it needs to perform interpolation. Since extra work means reduced performance, it seems reasonable to avoid double-quoted instantiation unless it's a necessity. As a huge fan of single quotes, I set out to prove just how naughty overuse of double-quoted strings really was. I built a test harness to compare the performance of code blocks, and started running tests. A basic fizzbuzz program seemed like a good first test. So using double then single-quoted strings, I ran 100 rounds of fizzbuzzing up to n = 100,000, and compared the user CPU time of the runs with a T-test. Dumbfounded by the results of the fizzbuzz tests, I thought that testing string instantiation exclusively would yield results more consistent with my original hypothesis. So I built the simplest test possible: 100 separate runs of a program that instantiates a single character string one million times. 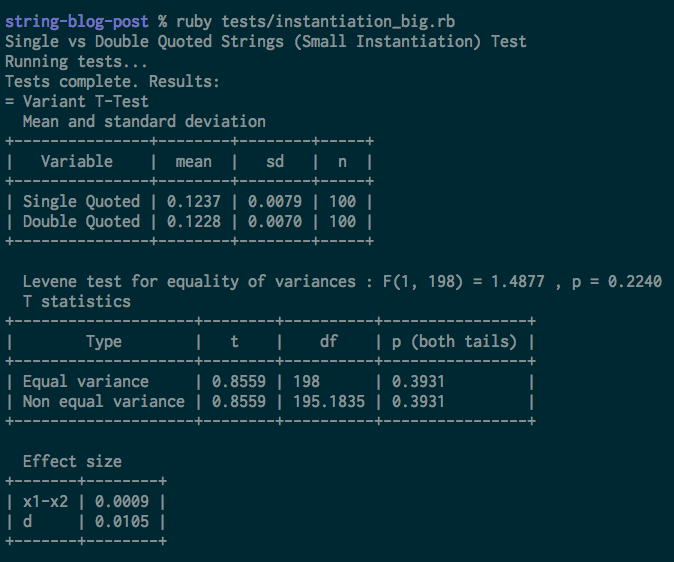 Well maybe interpolation matching causes a bigger performance hit with bigger strings? Okay, so what if the string was A LOT bigger? Like, "the entire script of The Sandlot"-big? Okay, so maybe we don't only care about runtime performance. What if we explicitly test parsing performance as well? Maybe the test harness has poor sensitivity? I'll create a test comparing the instantiation of a string and a slightly bigger string and reject the harness if there's no detectable difference. 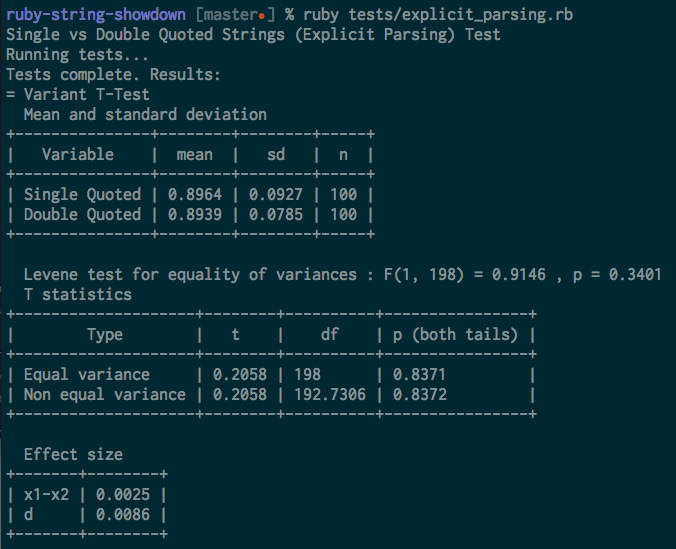 So if there's no meaningful performance difference between the two methods of Ruby string instantiation, shouldn't I just pick my favorite? Well, no. The absence of difference makes one better. Therefore always using double-quoted strings results in the least possible wasted time and effort. If you're a pragmatic Ruby programmer, just use double-quoted strings. 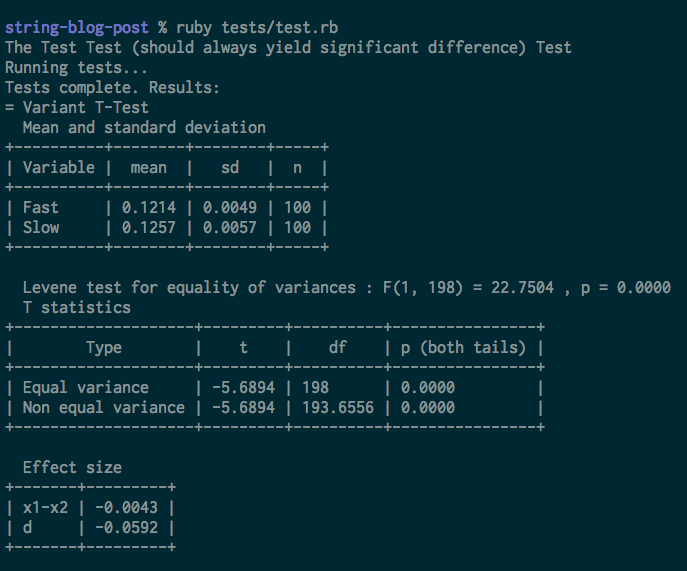 And if you're a theoretical performance devotee, well, you're probably not writing Ruby anyway.